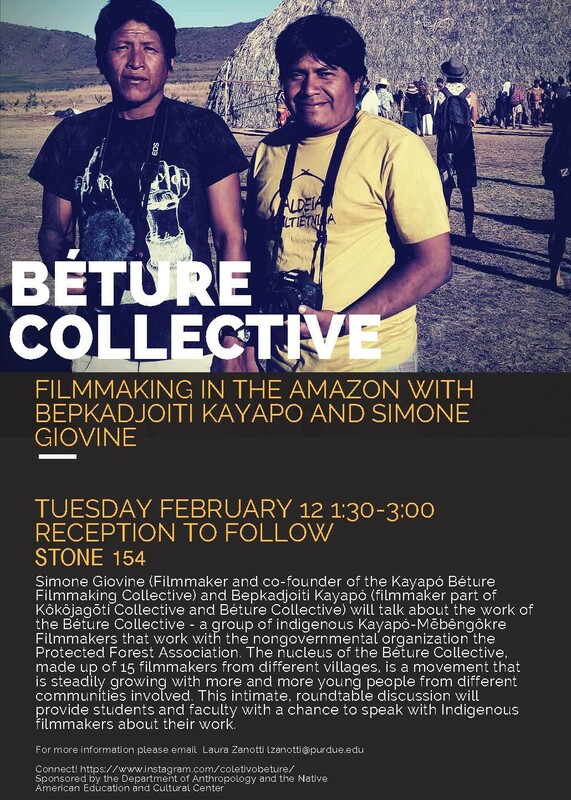 The Department of Anthropology is happy to announce, for the third year in a row, that they will be hosting Kayapó filmmakers and the Beture Filmmaking Collective to Purdue. Simone Giovine (Filmmaker and co-founder of the Kayapó Béture Filmmaking Collective) and Bepkadjoiti Kayapó (filmmaker part of Kôkôjagõti Collective and Béture Collective) will talk about the work of the Béture Collective - a group of indigenous Kayapó-M?bêngôkre Filmmakers that work with the nongovernmental organization the Protected Forest Association. The nucleus of the Béture Collective, made up of 15 filmmakers from different villages, is a movement that is steadily growing with more and more young people from different communities involved. This intimate discussion will provide students and faculty with a chance to speak with filmmakers about their work that focuses on cultural heritage, rights, and activism.